Hey everyone! Hope you all had a great weekend and a productive Monday! I’m back wearing more shades of blue and I’m kind of obsessing over it as of late. During the spring and summer months, I often find myself replacing black with navy blue. It’s a cooler color and gives off a more laid back vibe, which is perfect for summer. Trade your LBD for a LND and don’t forget your pop of cobalt! Love the marine blue on you! Gorgeous blouse! Absolutely love the print and colours! What a great blouse. Love the cobalt blue pop. pretty blouse, love the print. LOVE this look! That top and those heels are gorgeous! Loving the pop of cobalt heels! Love the look and colors! Stunning Rach. I’ve also been wearing lots of navy and cobalt blue at the moment. I’m a bit obsessed with those shades. I love blues, especially cobalt! I personally think it flatters everyone! Great post! Your style is amazing, love this look! I’m loving all the hues of blues in this look! That floral top is stunning! love that top/shoes combination! that color looks so great on you! Fabulous look, girl! Loving this color-scheme, so well put together! Love all of these blue shades together – reminds me so much of 500 Days of Summer and all of the cute blue outfits! I’m always a lover of a blue and white combination! Hi ! Would you mind doing a post on your hair products and how you style your hair everyday? Beautiful! Love the color combinations! Love this look! I totally agree with the navy! I just wore the most comfortable navy J.Crew to a friends wedding over the weekend & I am totally obsessed with it! I also scored it on sale which is another plus! I’ve been so into navy and cobalt recently – love this outfit! Those cobalt blue pumps really make the outfit stand out! I love it! Love all of the blue! Your top is gorgeous! I love that shirt and those shoes! So cute! You are stunning in blue.. those cobalt heels are gorgeous! I love this look Rachel!!!!!! Those shoes are fabulous!!!! i adore all of this blue! the shade looks great on you! What a fresh and easy spring outfit! I’ve been on a blue kick too, love how you mixed different shades of blue in this outfit! Love the blue hues & those jeans are great! Such a beautiful look! I love that blue on you! I love this look! That blue is beautiful on you! I love blue the colour blue to….one of my must have.. So chic! Love the color of the shoes. I love all the shades of blue! Especially love your oversized clutch!! I love the idea of switching out blacks and replacing it with blues/navy. Your outfit looks great. So effortless and chic. 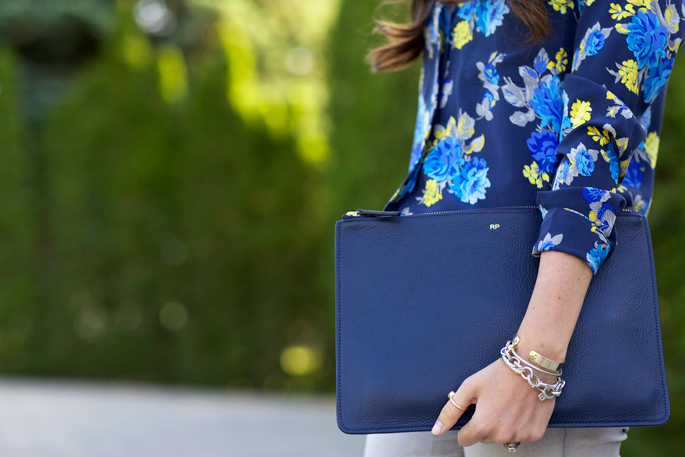 Love the pattern and the pairing of the navy clutch. Love the multiple shades of blue all in one look! Again, you never cease to amaze me, Rach! I was wondering how to pull of navy in the Spring without looking like I’m a season behind so thank you for the inspiration! I love the colour coordination. The blouse is stunning, love that you paired grey pants with this look and those heels are so cute. This is such a cute blouse. Looking like a model. You are gorgeous. Stunning! I love your top and those shoes. Royal blue is absolutely stunning on you!! I definitely need this blouse!! Absolutely agree with you! no more black…I love all the blue going on! Love the shirt and heels. Great outfit. All the gorgeous shades of blue!! Navy and cobalt are so gorgeous when worn together!! The other color that’s contrasts so well against the cool shades of blue is yellow! This blouse has the perfect combination. Cobalt shoes instead of navy give an expected pop of color. Love the grey jeans! LOVE this look. Seriously everything about it is flawless. You are one of my style icons! I have a similar obsession to blues (the colors, though the music is nice.) That shirt and clutch… <3. Love this combo! So chic! These shoes are sooo cool, love the vibrant blue color! THOSE SHOES!!! Amazing. This is a fantastic spring look, perfect for just before it gets too hot to wear jeans! 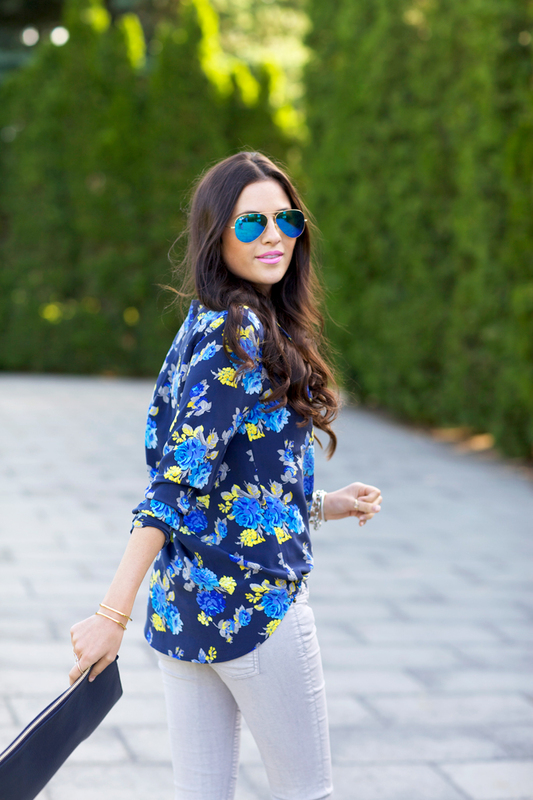 Love this blue floral blouse and cobalt heels…they grey jeans are the perfect balance! I am loving blue right now! All these pieces are beautiful! You got me singin’ the blues! How cute, cool & comfy casual is this??? Love the shirt & shoes to pieces! I Love you in Blue! You look AMAZING!!! 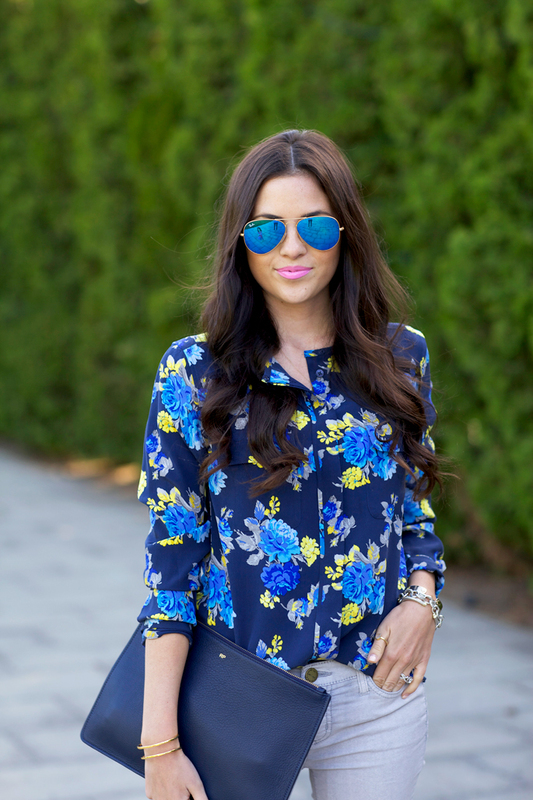 I love the pop of color, that floral blouse is gorgeous. I like the Sole Society heels too, I have a similar pair from BCBG. Blue is a good color for spring, calming indeed. I love the royal blue heels with light grey jeans. Such a pretty combination! The top is fabulous! I love the deep blue and the bright yellow. Can’t get enough of cobalt, ever! Loving these blues – especially those shoes! These shades are just perfect! You looking beautiful in this blue style. The floral blouse is really pretty and the shoes with the bow are adorable. I LOVE this outfit! It goes perfectly with your lip color, too. You look great!! What color are the lenses of your Ray-Ban’s? Did you get the blue or green? So chic. I love the different shades of blue and the floral top. Love it!!!!! Obssed with blues but sadly this blouse is $258! Love this look! The colors are so vibrant and elegant. This outfit is gorgeous!!!!!! My favorite so far!! !